Tokyo Disney Sea’s 10th anniversary is coming up and along with it a new attractions for the park – Jasmine’s Flying Carpets. This will be the third installment of the ride with the first appearing at the Magic Kingdom in Walt Disney World and the second at Walt Disney Studios Park in Disneyland Paris. The ‘carpets” are scheduled to open during the summer of 2011. With a total vehicle count of 16 and a cost of 2 billion Yen ($22 million), Jasmine’s Flying Carpets is “a ride attraction where guests can soar over Jasmine’s garden on a flying carpet. 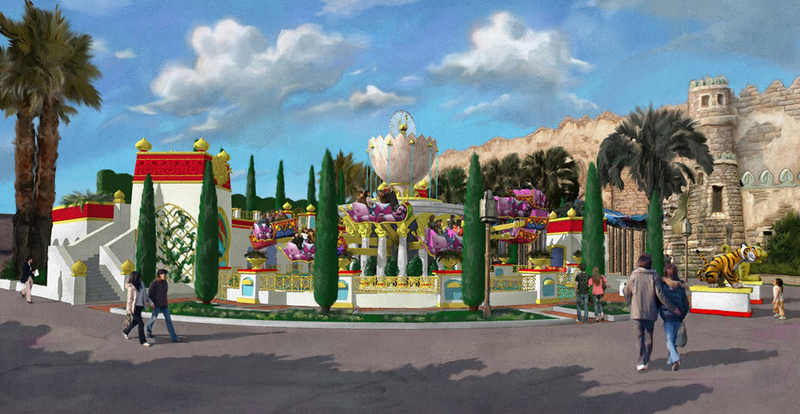 Guests will be able to maneuver their vehicle up and down to a height of 5 meters, and tilt the vehicle forward and backward, as if flying their own magical carpet.It is likened to Dumbo the Flying Elephant except of course you are flying on carpets as oppossed to “Dumbos” and there is Aladdin’s magic lamp at the top rather than Timothy Mouse. This uplifting ride can be enjoyed by all, from young children to adults. Guests can also watch their friends and family on their flying carpet from an elevated viewing deck”. The attraction will sit next to Sindbad’s Storybook Voyage.